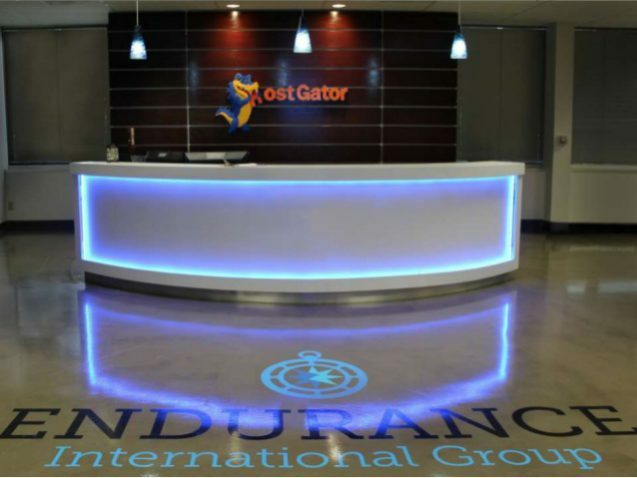 HostGator, a worldwide provider of dedicated web hosting, was one of the largest commercial real estate leases of 2013 in Houston. Their corporate headquarters at 5005 Mitchelldale Street occupies 61,056 square feet of the four-story office building near the intersection of I-290 and 610. We were interested to see how they were faring in their new Houston office space , so we dropped by to meet up with Doug Benitez, Houston Regional Director, for a tour of the property. One of the first things we saw in the reception area was an oversized stuffed Snappy the Gator, the HostGator mascot, a quirky blue gator that helps them stand out among other hosting options. HostGator is known for their great internal customer service. They have 24/7 phone, email, chat, and social media teams, and the workspace in Houston is set up to reinforce these teams. The office space does have the familiar rows of cubicle workstations frequent in technology companies, but they take an open office space approach in that employees can choose which space to work in. The walls are wrapped with fun gator-themed riffs on popular cartoon characters by graphic artist Joe Stutzman. What was the hardest part about relocating? DB: Since our business operates 24/7, the most difficult part was coordinating between the movers and our staff to make sure that everything was set up properly with minimal impact to our employees and our customers. DB: As a growing company, our main focus was to find a location that had ample office space and parking that could support our long-term needs. For years we were split between two different locations in the Houston area, but both limited our plans for expansion. We were fortunate enough to find this property last year. This is a great space because it’s really open, and we’re excited to expand in it as we continue growing. DB: HostGator was founded in 2002 by Brent Oxley, who started the company in his dorm room while attending Florida Atlantic University. Since then, we’ve grown into a world leading – industry recognized hosting provider hosting over 9 million domains. We provide shared, reseller, VPS, and dedicated web hosting services. We have nearly 500 employees in our Houston office and are continuing to grow. Two years ago Brent sold the company to Endurance International. What did you do before HostGator? DB: Prior to HostGator, I was an Internet Entrepreneur focusing on advertising and marketing. I ran several successful websites which created a large visitor base bringing in advertising revenue. I’ve been with the company for 6 years. All of the other upper management in the Houston Corporate office started out on the front lines doing customer support. How does the daily workflow of your business inform the use of your space? DB: The floorplan and location of offices within the different building wings has been really conducive to the successful workflow of our different departments by allowing us to segment the areas that we need. The 2-story office suite features private conference rooms, single offices and open cubicle spaces for support, sales and billing departments of the company. There’s no assigned seating, but lots of extra space. People tend to go to the same desk every day. Designated breakout areas throughout the office space create privacy for collaborative discussions between teammates. We did research on lighting to understand what the best type/level of lighting is for employee productivity. It’s important to us since our employees spend a lot of time at the computers. Some employees like the lighting and others don’t. For instance, some people prefer more of a living room type office with no overhead lighting and a standing lamp. More importantly, the layout of the building has given us the opportunity to enjoy the perks we had in our old building, as well as adding several new dimensions to help with employee engagement. With the extra space, we’ve added a cafeteria that also has room to hold game room items like a Ping-Pong table and arcade games. We’ve also recently added a gym and a dedicated video game room for lounging, watching TV, and hosting video game tournaments. Do all employees work in the office, or do you have remote workers? DB: Since we’re a web hosting company, there are security concerns around working from home. Also, it’s great for morale for people to be in the office and to engage with them face to face. It’s part of the company culture. The company culture is young, fun, it can be fast-paced, casual and constantly changing. There is lots of opportunity for advancement. How is HostGator growing in the space? DB: We have been fortunate enough to be able to continue to expand our workforce and now have the extra space to accommodate the new employees. We’ve also been able to create new training areas that can accommodate both small and large groups so that we can invest more in our employees. In addition, the numerous private offices and conference rooms allows our leaders to conduct meetings more frequently. HostGator has a good range of international business, and surprisingly enough language barriers are low. They mainly use Google translate and Spanish speakers – the overnight team sees most of this traffic. But most people speak pretty good English. DB: Morale is a big priority because the philosophy at HostGator is to keep the employees happy in order to keep the customers happy when they call in for support. The upper management at the company has all risen through the ranks from customer support positions, so they have a good understanding of the demands of the work. Since employees are frequently on the front lines of customer service, HostGator is big on employee perks. We have added in several game rooms, a workout room, provide a free employee lunch to every day in the cafeteria, and have an in-house masseuse. We regularly do quarterly company outings. The latest one was to Oil Ranch, a big outdoor amusement area with a bouncey house and other family-friendly activities. Recently HostGator hosted a pre-screening for a private X-Men movie at the movie theater with free concessions for employees. I’m still an entrepreneur by heart and continue to take risks on new ideas that are constantly coming to mind. Many of the inspirations have been the new startup companies selling for millions if not billions of dollars, with outside-the-box ideas that benefit people in their everyday lives. Technology is a big part of my life, which I plan on contributing to, with hopes that one day an idea of mine will take off. Visit HostGator at www.HostGator.com or find them on Twitter @hostgator or on Facebook at facebook.com/HostGator. If you’re looking for your own office like this in Houston, check out this helpful Office Space Search of our available properties in Houston.